When photo editing software is used to compensate for sloppy camera settings, poor composition or incorrect lighting, the photographer must, by definition, degrade the image in order to “fix” it. Exposure adjustments, color temperature adjustments and cropping all remove pixels and, therefore, reduce detail in an image. The photographer does not deliver the best images and the client suffers with this lower quality. Recently I took some photos of an artwork restoration project. Tom Jones owns Sierra Hills Framing in downtown Lincoln. 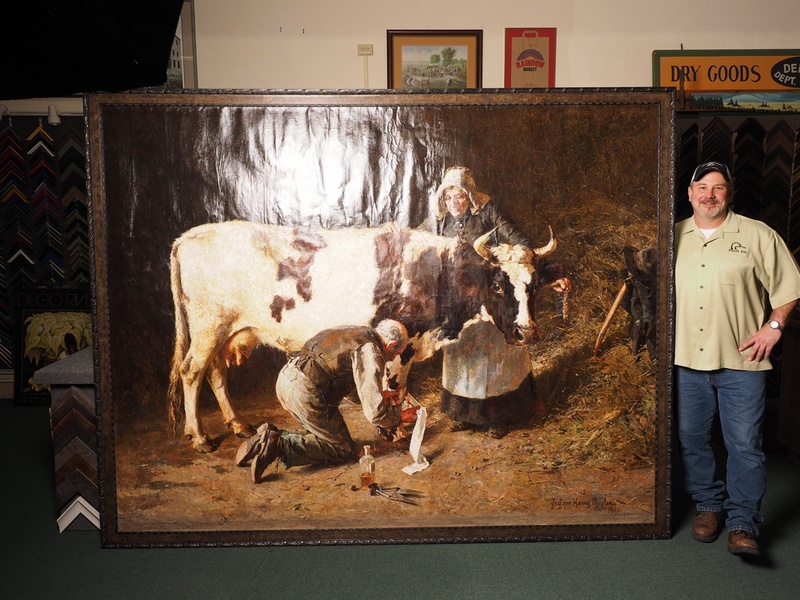 He recently framed a large painting that had been meticulously restored and he wanted some photos of the finished product before it was delivered to the owner. 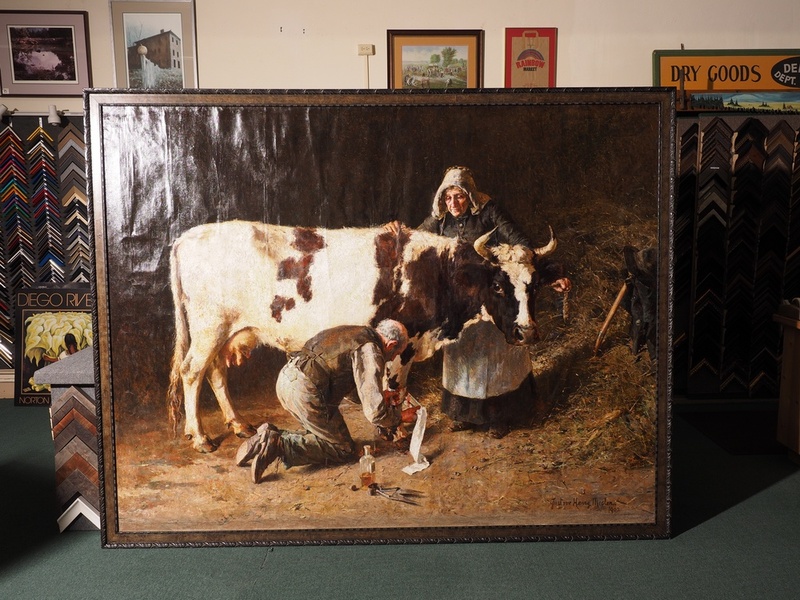 Here is the back story on this painting: The artist was Gustave Henry Mosler, who lived from 1875 – 1906. He painted this image in 1902. The painting is nearly 8′ tall and about 11′ wide. 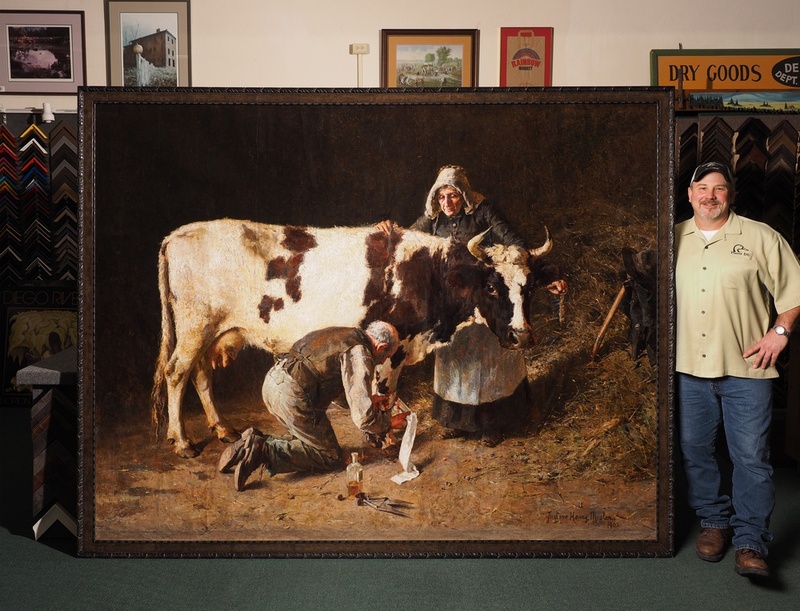 The owner discovered it stored in a barn on rural property that she had inherited. When she found it, the painting was rolled up, had several rips in the canvas and was covered in mud and dust. At first she considered discarding it without investigating, but soon realized what it was. 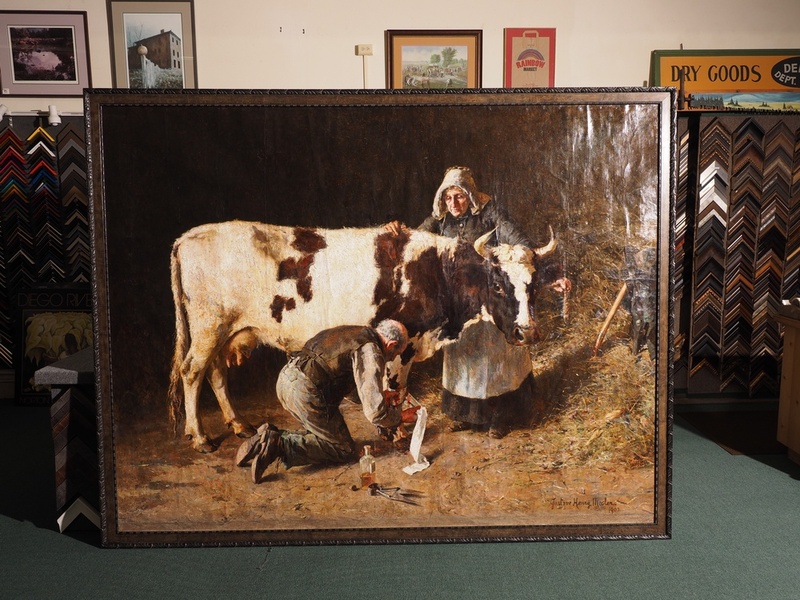 A professional fine art restorer in Grass Valley brought the painting back to life by attaching it to a new canvas and attaching it to a stretching frame, and carefully cleaning it. Tom Jones completed the final framing work. I first considered the best way to light the painting in order to photograph it. The surface of the canvas has several ripples and creases, and the glossy paint finish was very reflective. I determined that any lights within the family of angles would reflect on the surface. If I moved the lights more to the sides, the raking of light would bring out the rippled surface and likely reflect those as well. After looking at the painting, I decided the best solution was to photograph this item with the full intention of using Photoshop as part of the primary capture process. I would light and shoot the painting as two separate images and blend them into one image in post production. The most important key to blending images is to use a sturdy tripod – this provides images that register and align without any changes in perspective. I positioned the tripod at the center of the painting, and raised it as high as it would go. I noticed that the painting was leaning at a different angle than the back of my camera, so I made a note to also adjust the perspective of the final image. I chose not to move the painting at all. I positioned two monolights, each one high on a light stand on either side of the camera, about 10′ away from the camera. Each light had a 7″ reflector and cast a bright glare on its respective side of the image. In my test shots I could see that the placement was correct for the effect I wanted. I was getting a clean shot of each half of the image. 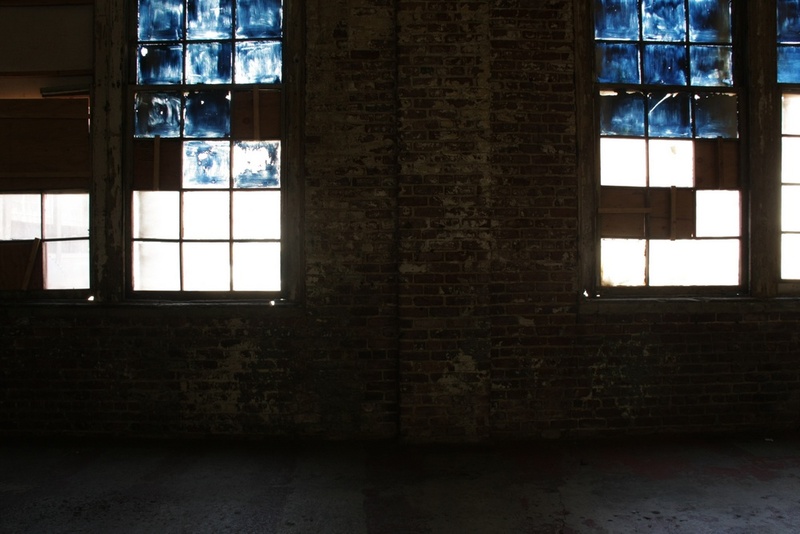 With the lights set at equal power, I shot two frames, each with only one light firing. With one light firing from the left, its reflection appears in the upper quadrant of the painting, but the part I plan to use is the right half. The light on the right gives clear color, and very little reflection on the left half of the image. I knew had the pieces I needed to make a complete image. Before moving anything, I also positioned Tom to one side of the painting, put a softbox on one of the lights, moved it closer to Tom and took an additional photo with him standing next to the painting. This would give me an additional frame for blending. The only part of this image I cared about was the section outside of the edge of the painting where Tom is standing. 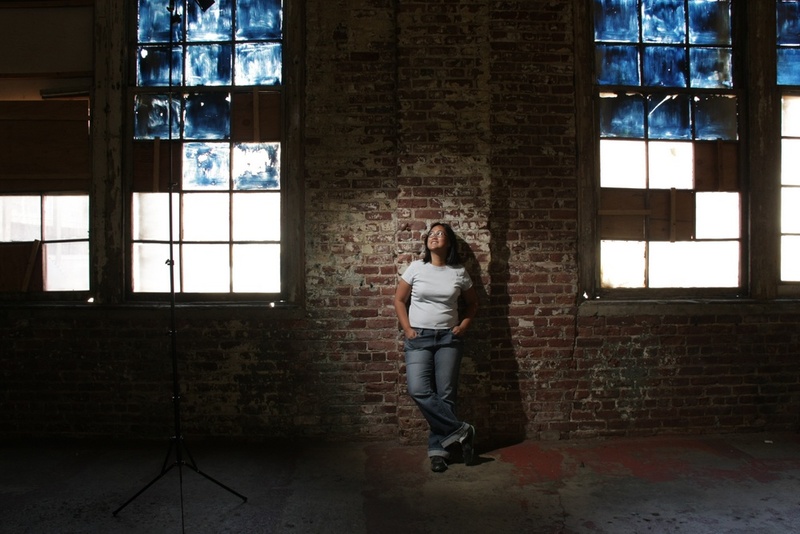 The softbox is visible in the upper left part of the image. That was it for the camera – half of my capture was done. I brought the images into Photoshop and put each of them in a layer. With simple layer masking I was able to blend the two images of the painting with very little effort. An additional layer mask allowed me to include Tom in the photo, as seen below. The final image, the result of a planned composite of three images. In this result, the colors of the painting are reproduced accurately and as vibrant as the original. Including Tom in the image gives the viewer immediate information about the size of this painting. I spent about 5 minutes planning my approach. The setup time was about 10 minutes, shooting took about 5 minutes and the post production work was an additional 10 minutes. This is a similar technique to the way I’ve made many real estate photographs, where the lighting gear is best located within the image and removed later in a blended image. The light stand is visible in this frame. One ambient-light image with the light stand removed. The final image – no light stand visible. When a photographer appropriately plans to use editing software as part of the image-making process, the resulting photo can be made quickly and easily, without loss of detail. Ron, thank you for sharing. 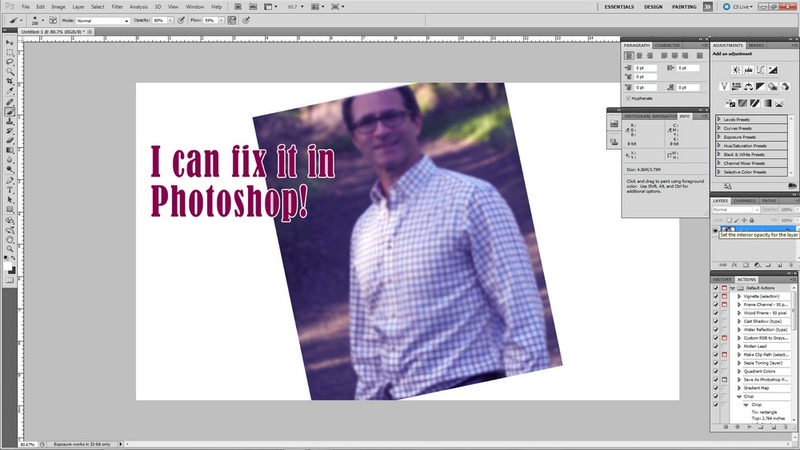 Now I just need to learn Photoshop. Most of what I do I use Lightroom for. I have Photoshop, I just haven’t taken time to learn it yet. By the way, my Olympus OM-D EM-10 has been the only camera I have been using since I got it. I am glad I listened to you, I really like the size, weight and image quality. I also like being able to control it with my iPhone and / or iPad and see what the camera sees. You were right, the EVF is very useful. Thanks for sharing your experience. Glad you are happy with your EM-10 – lots of features in a small camera!